Sovngarde is the Nordic afterlife. Those who are valiant in life are rewarded with an eternity here in the Hall of Valor, where they eat, drink, brawl, and sing. It is here where you'll have to defeat Alduin the World-Eater. Sovngarde is a realm within Aetherius to which valiant Nords go upon death. Despite it being a place for the dead, the living may visit Sovngarde, provided they have a way to get there. Your only means of accessing Sovngarde is through the portal created by the dragon priest Nahkriin atop Skuldafn Temple during the related quest. At this time you will find much of the land is shrouded in fog, and Alduin flying the skies, swooping down and devouring the very souls of his hapless victims. The land itself is rich and vibrant, sporting much flora including many red, blue and purple mountain flowers, several tundra cotton plants and an occasional patch of mora tapinella on dead tree stumps. There appears to be no fauna found within Sovngarde. There are large identical statues lining the stairs and surrounding the edges of the entire valley. On top of the central hill, you can find what was once a word wall, now covered in large rocks. The most notable place in Sovngarde is the Hall of Valor, also known as Shor's Hall, a massive hall in which the dead drink, feast, and sing for all eternity. During the related quest, the portal brings you to the head of the valley at the top of a series of stairs. To reach the Hall of Valor simply descend down the stairs and follow the partially paved path that winds through the fertile valley before leading directly to the gatekeeper, Tsun. 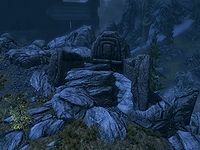 You are likely to encounter several souls lost in the fog, mostly of unnamed Imperial legionnaires or Stormcloak soldiers, but also any named Nord who has died bravely may be found in Sovngarde. Those that can be found vary depending on your game play and which quests and locations have been completed or visited, for instance, High King Torygg and Svaknir can both be found in the fog. The Hall of Valor is on a pinnacle of rock separated from the rest of Sovngarde by the bottomless chasm that is spanned by the whalebone bridge with Tsun, the gatekeeper standing on the near side of the bridge on land between twin shallow pools on either side fed by streams before joining the pools, only to empty over the edge of the chasm as great waterfalls. When you reach Tsun, he will ask you by what right should you be allowed to enter the Hall of Valor. Depending on your progress in various questlines you may have several options to choose from. Whichever you choose you must then prove your worth in a warrior's duel regardless of the right that you claim. Once you reduce his health significantly enough the fight will stop and you will be able to proceed across the whalebone bridge to a paved terrace with two curving wings of stairs leading up to a row of four doors that all lead into the hall. 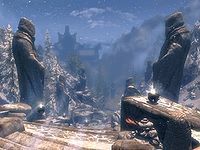 Although Sovngarde will technically respawn after ten days, there is no way to return to it after the main quest without the use of console commands. It is one of the few places in Skyrim that cannot be revisited, so be sure not to leave anything behind. Beneath the Whalebone Bridge is a seemingly bottomless pit and immense waterfall. Falling into this area triggers instant death, even if you could survive the fall damage. You can only survive the fall if you enable god-mode via the console. It is the only situation in the game wherein you are killed instantly and unconditionally. Sovngarde is said to be ruled by Shor, but he does not appear to you. The "stars" in Sovngarde are actually slowly moving around in the sky. The constellation of the warrior, the thief, and the mage can be seen in the sky of Sovngarde. Even though they're technically dead, the Detect Life spell will detect the heroes of Sovngarde, as opposed to the Detect Dead spell. It's possible to kill the generic soldiers and Svaknir, and soul trap them. They and any loot on them will be despawned after Alduin appears. This page was last modified on 5 November 2018, at 04:45.